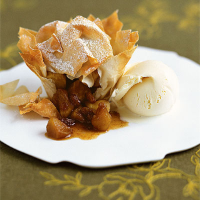 Bramley apples are the best cooking variety to make into these sweet little tarts. Preheat the oven to 180°C, gas mark 4. Place the apples, sugar, lemon zest and juice, cinnamon and sultanas in a large pan and cook gently for 5-7 minutes, stirring occasionally, until the apples have softened but still hold their shape. Allow to cool. Unroll the pastry and cut into 32 x 14cm squares, reserving the trimmings. Cover the pastry with a damp cloth, to prevent it drying out. Take one of the squares and brush with butter, place another square over the top at an angle to make a star shape. Repeat with 2 more squares of pastry, brushing each with butter. Gently press into a muffin tin. Repeat with the remaining pastry until you have 8 pastry cases. Fill each case with the apple mixture, then brush the trimmings with butter, scrunch them up and place on top of the tarts. Bake for 20-25 minutes until golden brown. Serve each tart dusted with icing sugar mixed with a little cinnamon, with a scoop of Waitrose Vanilla Ice Cream. You can also use a mixture of apples and peeled pears.